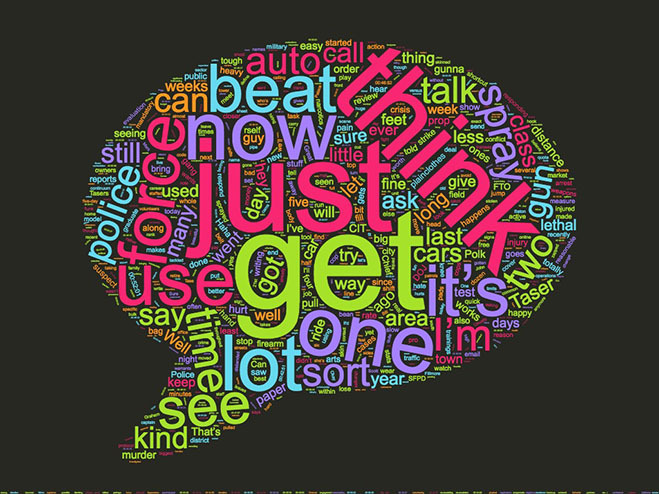 Word Cloud created based off transcribed interview with Capt. John Jaimerena. A year and a half ago, Capt. John Jaimerena took command of San Francisco’s Northern District Police Station. And what a year it has been — auto break-ins are up, and more homeless residents are living on the streets. “We came in first place at Northern Station for auto break-ins, something you don’t want to be first place on,” the 24-year veteran of the department told community members at the monthly district meeting earlier this month. Although Jaimerena could also report that the break-ins have been trending down in the last couple of months and that the district officers were “making a ton of arrests,” it’s clear that running a police district in 2017 is particularly difficult. Jaimerena talked about the challenges in an interview with Mission Local. One of those challenges is running a police district at a time when officers across the city are going through training for crisis intervention and the new use-of-force policy. In the end, they’ll be better trained. But in the meantime, that means fewer officers on duty. At the same time, a renewed focus on community policing means that more officers are walking a defined beat and can’t easily be redirected. Jaimerena said crime will likely diminish in those areas. But he worries that other hotspots such as Japantown, Alamo Square and the Palace of Fine Arts will become more problematic. The Northern Police Station’s 145 officers are responsible for a rectangular area that is bordered by the San Francisco Bay on the north and Market Street on the south. Larkin and Divisadero streets make up the long eastern and western sides of that rectangle, home to some 82,000 people, 65 percent of whom are white. For many business owners in the Fillmore, another big change has been more homeless people on the streets. “We had to call the cops on a homeless person who was being obnoxious … breaking empty bottles,” said Josh Rodriguez from the Social Beauty Company. For Jaimerena, these are just two of many similar stories. Northern Station has a four-officer Homeless Outreach Team headed by Sgt. Kim La Salle. She responds to such calls and makes connections with the residence or business owner. To better prepare police for encounters with the homeless, officers across the city are undergoing crisis intervention training, which is a five-day course held at the San Francisco Police Academy. The new protocol for responding to calls where the subject is acting erratically requires that an officer trained in crisis intervention and a sergeant be present. And the protocol focuses on using weapons that are less lethal, such as beanbag guns. Officers are also participating in a two-day training session on the new use-of-force policy, which includes de-escalation tactics such as gaining time and distance from a subject. Jaimerena said that 60 to 70 percent of the officers at Northern Station have completed both trainings. By mid-October, all officers will have finished the use-of-force training. In the meantime, he’s making do with the officers he has on hand and hoping that auto break-ins continue their downward trajectory.